Look how fast these guys are growing! 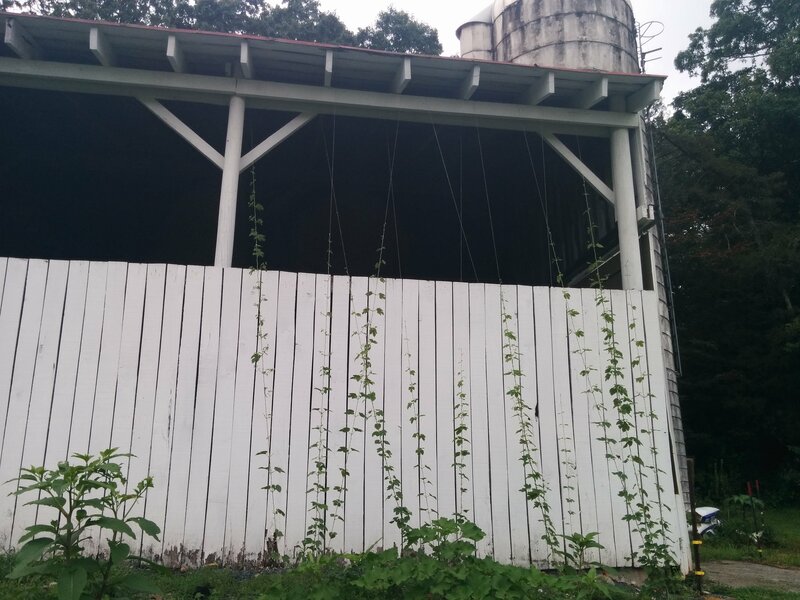 Hops will generally grow a foot per day once they find something to climb but it never ceases to amaze me. Laziness is certainly partly to blame. Curiosity is where the remainder of the blame lies. My knowledge of identifying trees and their scientific names is excessive; bordering on obnoxious by the opinions of friends with whom I share outdoor adventures. My skills with identifying herbaceous plants are weak but as I am actively working to improve, each of these plants offers a learning opportunity. So I generally let them go. Side Note: my skills on identifying grasses are all but nonexistent. 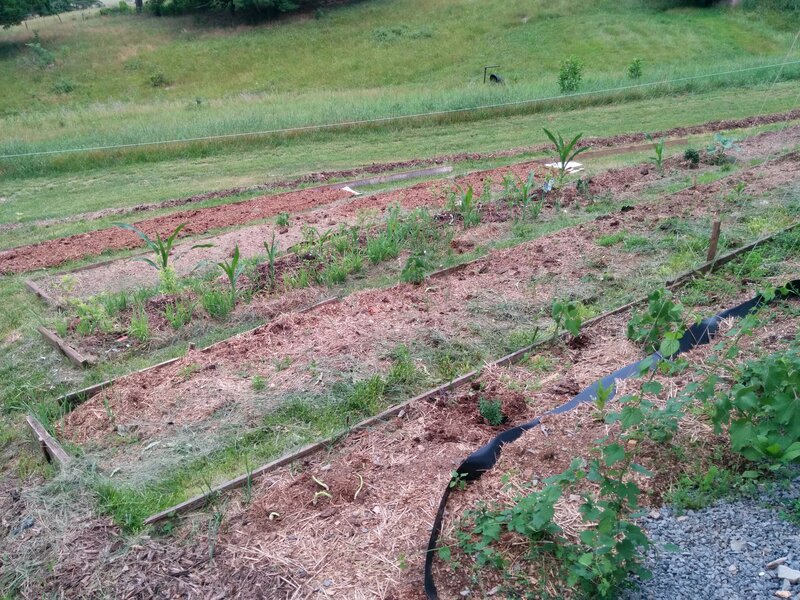 In addition, most of my garden beds are fallow and contain animal manure/bedding. Root action of any kind alleviates my concerns that the beds have not composted enough to be cultivated by next spring. I certainly remove any weeds that interfere with my garden plantings. To be fair, I will probably be less generous to the weeds once my soil is ready to be cultivated fully. Most broadleaf weeds are annuals thus not presenting much of a threat to the garden. Some of them, like false strawberry, are biennials. However the one thing they have in common is providing nectar and/or pollen to pollinators, both the native and my honeybees. Along these lines, they attract the pollinators to my crops! This last point can be coupled with the one on curiosity- with my biological approach to farming, any one of those weeds may possess characteristics that make it a valuable tool as I found out with the unexpected Savior from Japanese Beetle Destruction. The japanese beetles decimated my young grape plants by eating most every leaf in the week I was gone for a wedding. So I set out to find a biological solution to combat these pests. Chickens and other fowl will eat the larvae from the ground decimating the adult population of beetles preemptively. But this is not much help in my current situation! Another common solution is good old fashioned hand removal of beetles into a bucket of soapy water. If you have chickens, just drop the beetles into the bucket of water and use them as treats for the chickens once the beetles drown. This has been my course of action. Beetle traps are not recommended because they attract more beetles from far away leaving the gardener to deal with the beetles widely surrounding the garden instead of only those in close proximity of the garden itself. Plus some research has shown that beetles deploy pheromones to attract others when an individual finds a food source. Certainly not ideal! Yet I was surprised not to find any documented plants that trap or at least attract japanese beetles away from the harvestable crops. Again, simple observation has proven its power. This plant has drawn all the beetles in the garden to it. Clearly they are heavily feeding on the leaves and clearly they are making the next generation of beetles atop this plant. Instead of many many beetles on the remaining 10% of my grapes leaves (decimate is to be taken literally both times in this post), there is usually one every few days. This plant is drawing them away from the valuable crops allowing me to focus my soapy water removal strategy on the two places where this plant grows opposed to every grape and hop plant in the garden. I’ve been trying the key this plant and figured out the genus: Persicaria. I will have to wait until it flowers and maybe fruits to find the genus. Needless to say, this plant will be in my garden every year! Now its time for the catch. 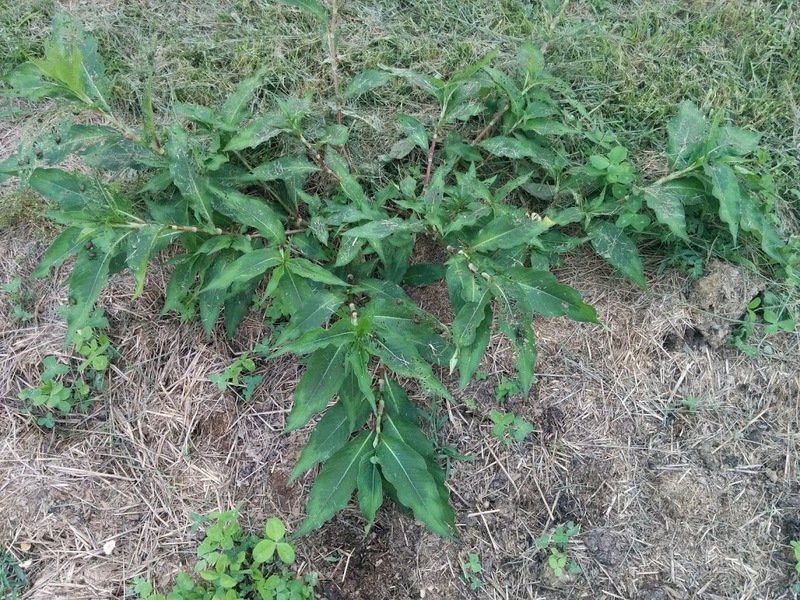 I don’t know, maybe a sunflower? I’m also pretty sure there is a soybean plant too, but it could just be a weed. Whether these were mixed into the pellets of cottonseed meal or just seeds that snuck in from the mill shared with other feed sources, these uninvited guest have taken up residence in my blueberry beds. 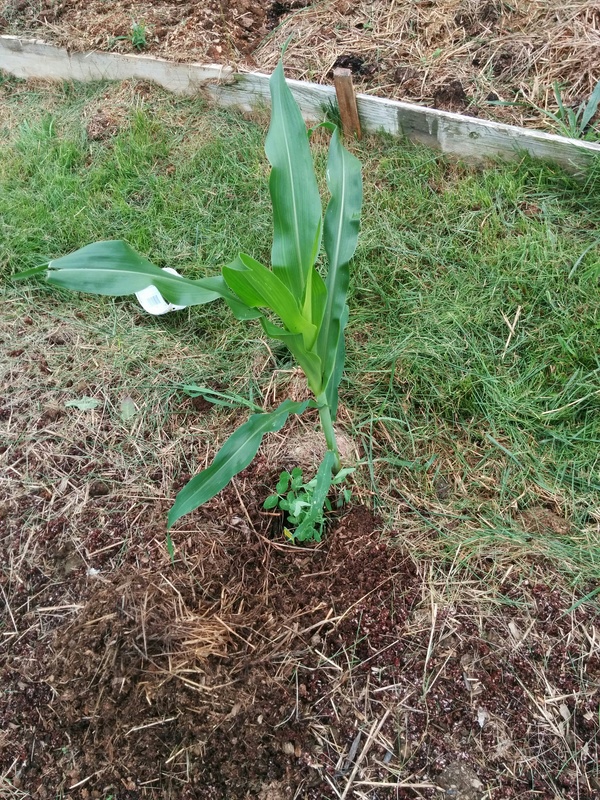 I’m not too inclined to do anything about it as: I have no corn this year to be contaminated by gmo pollen, I’ve never grown sunflowers or corn but plan to so they will be good learning experiences. I don’t have much of an excuse for the cereal grain. Hmmm….I’VE GOT IT: it will act as a nursery plant for the clover ground cover I sewed. Lazy gardening at its finest! If these guys survive the ever lowering pH of that particular garden bed, they have earned too much of my respect to cull. While searching for ways to maintain and increase the acidity of my blueberry beds, I stumbled across cottonseed meal. It both adds nitrogen and helps to acidify the soils as it breaks down. Great…Get two birds stoned at once! My only option to procure cottonseed meal is from the local feed mill right down the road. However as animal feed, not soil amending, is its intended purpose, it comes pelletized. At $13/50 pound sack, I figured I would try it out. I applied 200 pounds to my 80 square foot blueberry bed and mulched with shredded hardwood. After the first rain was where the magic happened! The pellets exploded in volume changing from tiny compressed cylinders to small poofs of cotton. As I was preparing to irrigate as the week following the storm had no rain, I pulled back some mulch to check the moisture of the soil. To my surprise, the puffy cotton meal was still significantly moist. As a result, I am contemplating either mixing cottonseed meal pellets into my mulch, or laying down a thin layer below wherever I mulch. At the very least I may add some around plants in the summer when rain becomes scarcer. However there is one downside to this story that I will post tomorrow. 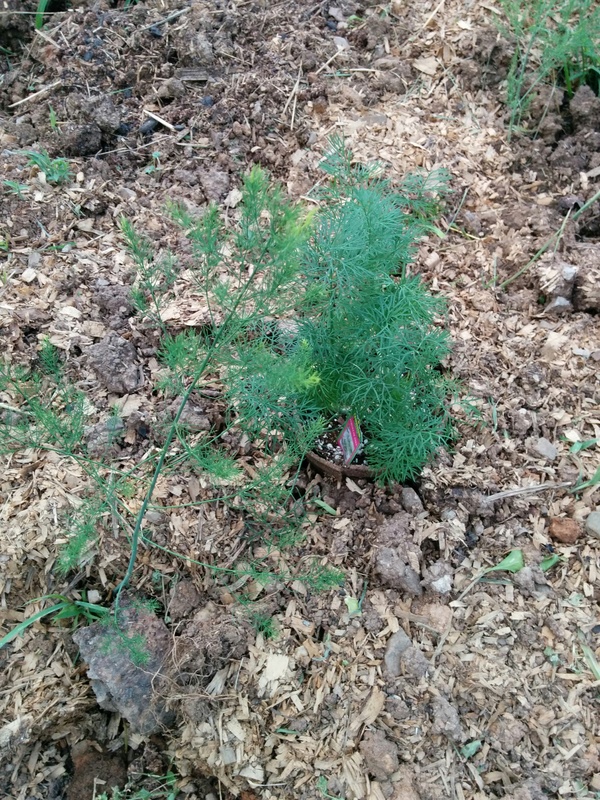 Planting asparagus is labor intensive. Or at least it is in my garden beds built on half-century old rocky fill dirt. Additionally, since the holes cannot be refilled for a few weeks, the excess dirt also needs to be stored somewhere. 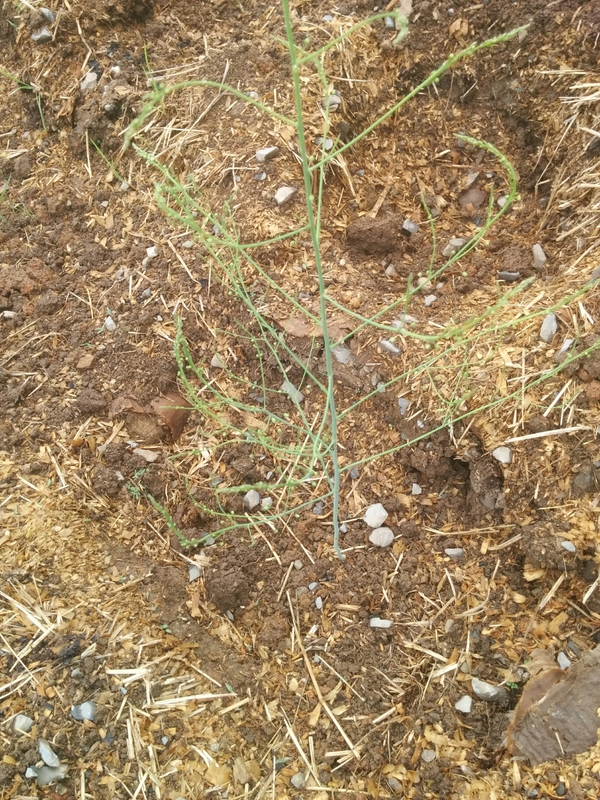 When siting your garden bed, remember that asparagus have a life spanning decades. I don’t know if I really need this disclaimer, but my farm will not be seeking organic certification due to the immense financial burden that doing so has become. There are also some philosophical reasons from which you will be spared…for now at least. But I hope you agree that my methods fit the bill! Asparagus needs to be buried deep. Eight inches to be exact but in my case, I dug deeper to remove and rocks that might inhibit root growth. They also need a wide hole in which the crowns can be adequately spread. 12 inches to be exact. also a digging iron in my case. Blasted rocks! I minimize these typically. 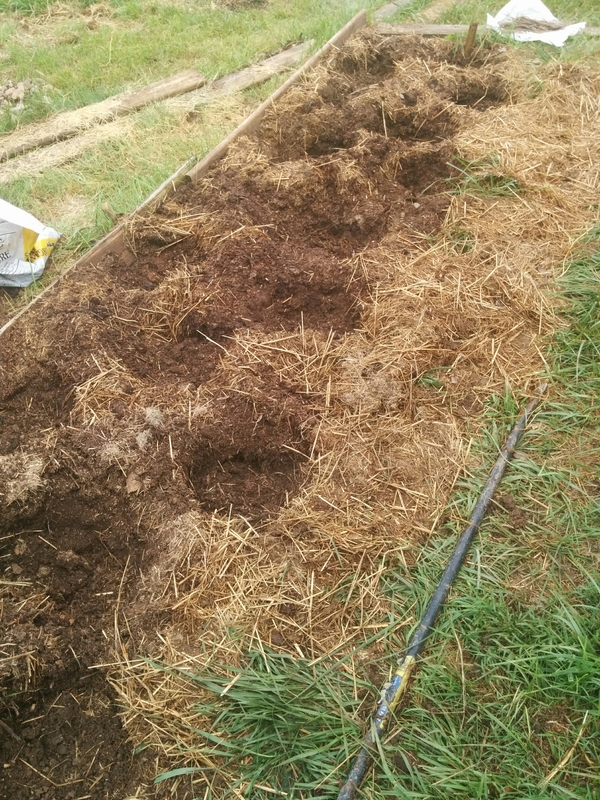 As the depth required at planting took these plants in to the heavy structured subsoil, I did use a handful of organic manure and humus (NPK- .5:.5:.5) per plant. It was $1.79 per 40 pound bag at walmart. 1 bag was enough for 25 plants. Eliminate existing weeds or turf to limit competition for nutrients. 8 inches deep, 12 inches in diameter, 12-18 inches apart. I efficiently used geometry (well, trigonometry) to my advantage! I put half of a handful of organic manure and humus into the bottom of the hole in a cone shape to better accommodate the form of the crowns. One half handful of the organic manure and hummus was placed on top of the crowns, then normal garden soil to finish burying the crown. 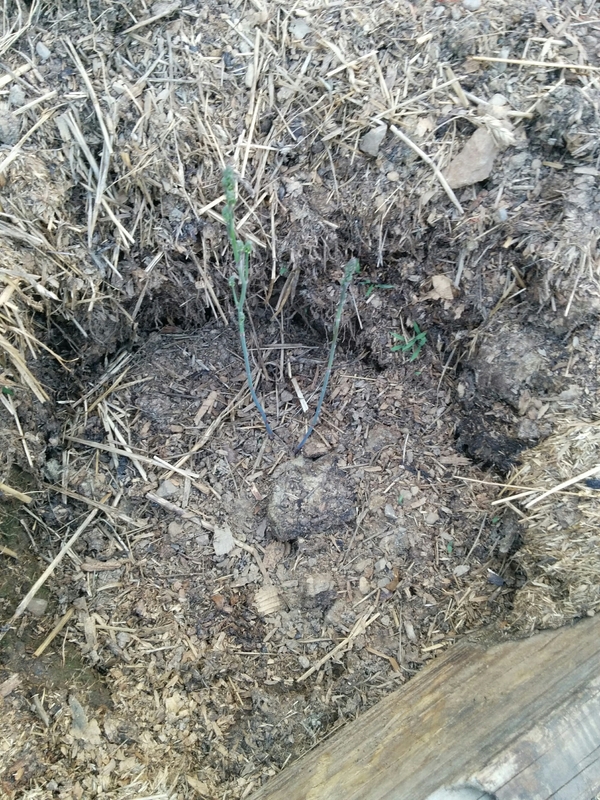 When the sprouts are a few feet tall and have become ferns, refill half of the remaining hole. 2 and 3. Planting holes dug. Note my soil amendment bag to the left of the frame, bundle of crowns up top. 6. Water the plants, no image needed. 7. Refill the hole when the plant has achieved a few feet in height. 8. Have not completed this step yet, will update with a picture when I have! Thats it! 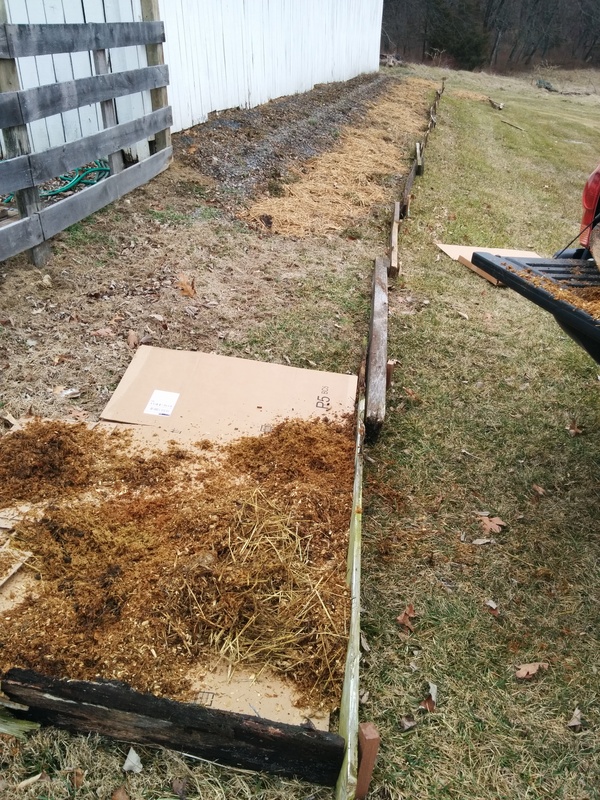 After two seasons of unharvested sprouts, you will enjoy 20-50 years of early spring, fresh, nutritious greens harvested before most other plants have come out of winter dormancy!